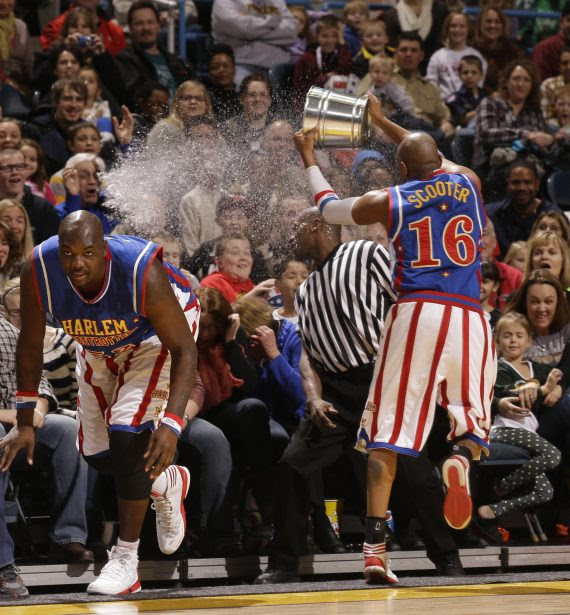 Harlem Globetrotters are coming back to Cali in February. Win tickets here or use our discount code below when purchasing. My kids and I have gone to see the Harlem Globetrotters at STAPLES Center a few times now, and each time it’s a great show. It’s totally worth the trek downtown and I don’t say that lightly. Wherever you live in SoCal or if you will be visiting during their shows here, there is a Harlem Globetrotters event coming near you! And new this year (we have GOT to see this) the Globetrotters will debut basketball’s first 4-point line! I have no doubt these superheroes of basketball can hit those shots. 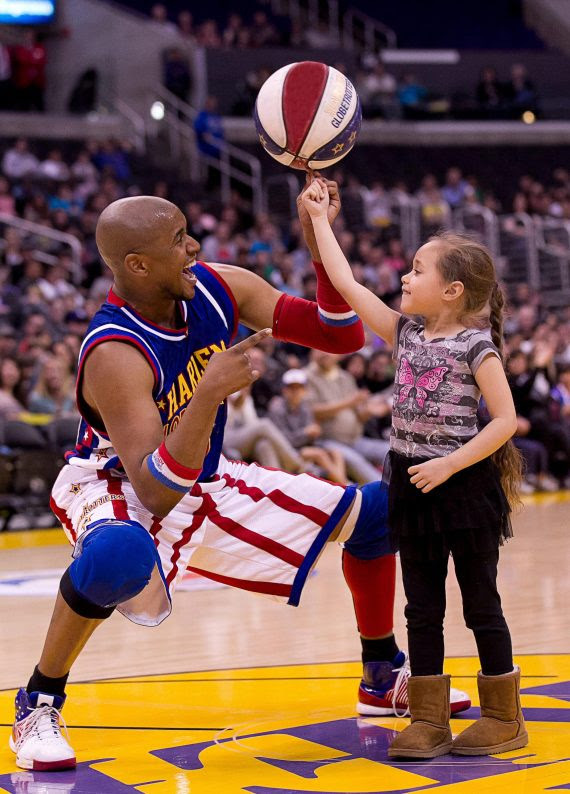 Celebrating decades of smiles, sportsmanship and service to millions of people worldwide, the world famous Harlem Globetrotters will return to the Los Angeles area Feb. 11-19. It’s a great family adventure of wholesome fun that makes for special memories. Their one-of-a-kind show is unrivaled in the world of family entertainment with incredible ball handling, hilarious comedy and loads of fan interaction, including a post-game autograph signing. Ontario at the Citizens Business Bank Arena on Saturday, Feb. 11, at 2 p.m., and 7 p.m.
Anaheim at the Honda Center on Sunday, Feb. 12 at 2 p.m., and Saturday, Feb. 18 at 1 p.m. and 7 p.m.
Mission Viejo at the Saddleback College Gym on Monday, Feb. 13, at 7 p.m.
I’m giving away a 4-pack of vouchers good for tickets to any of the above shows! Leave a comment on this post (not Facebook!) to enter by 11:59 PM on Thursday, February 2. Winner will be chosen by random drawing from qualifying entries. As soon as I receive your mailing address, I will mail the vouchers to you. Extra entry if you follow Agoura Hills Mom on Instagram or like my page on Facebook (just let me know in your comment). 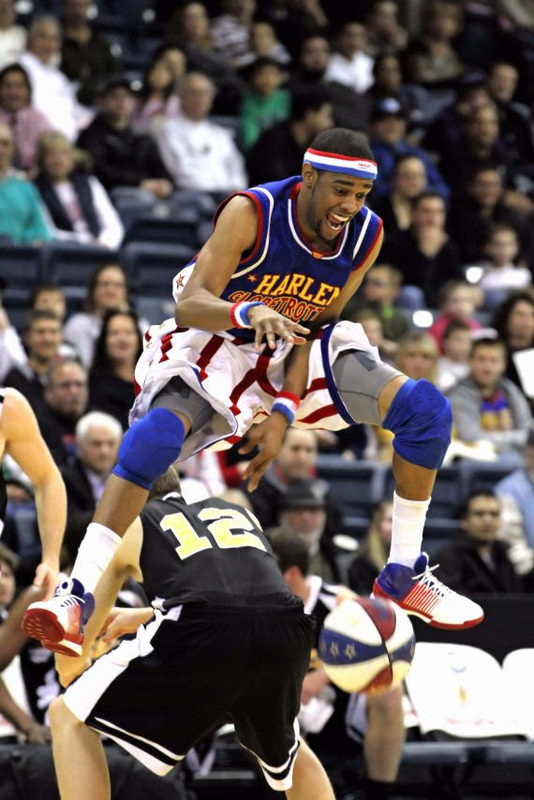 Harlem Globetrotters return to Southern California this month! A few years ago I had the chance to see the Harlem Globetrotters in action at the Staples Center in downtown Los Angeles. Their game/show was very entertaining for me and my friend and our young sons. In fact, my son described the players’ antics in great detail for weeks afterwards. I am looking forward to taking my other son to see them now, because the Harlem Globetrotters are returning to Southern California this month! Anaheim at Honda Center on Saturday, Feb. 13, at 1 p.m., and 7 p.m., and on Sunday, Feb. 14, 2016, at 2 p.m.
Mission Viejo at the Saddleback College Gym on Tuesday, Feb. 16, at 7 p.m., and Monday, Feb. 22, at 7 p.m.
Santa Barbara at the UCSB Events Center on Wednesday, Feb. 17, at 7pm. Ontario at Citzens Business Bank Arena on Saturday, Feb. 20, 2016, at 2 p.m., and 7 p.m.
Los Angeles at the Staples Center on Sunday, Feb. 21, 2016, at 12:30 p.m., and 5:45 p.m.
My younger son actually plays basketball in the Agoura Youth Basketball league, so I know he’ll enjoy it just as much if not more than his brother did! Are you a fan, or wish you could go see the show? Game? (I never know what to call it!) Tickets are available on the Harlem Globetrotters’ website here, but you can also win a four-pack of vouchers redeemable for tickets to any of the games above right here on Agoura Hills Mom! Just leave a comment on this post between now and 11:59 PM on Monday, February 8. The winner will be chosen at random from qualifying entries and the vouchers will be mailed to you on time to redeem them for even the earliest game. I received complimentary tickets to a Harlem Globetrotters game. All opinions are my own.